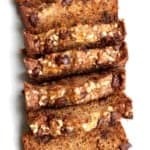 The irresistible combo of chocolate and peanut butter in this banana bread takes it to the next level of deliciousness. 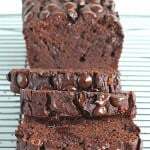 Let me list of a few of my favorite things: chocolate, peanut butter, bananas and bread. And I assume I’m not the only one?! Seriously, I could live off of these four foods the rest of my life and be completely satisfied. I eat them by themselves and also together every single day and wake up craving them all over again the next day. And that, my friends, is how this beautiful loaf of banana bread was born. I bake banana bread every week so it was due time I stirred peanut butter and chocolate chips into the batter. And not just the batter, but I top it with the most scrumptious peanut butter-brown sugar streusel. Just look at that streusel! This loaf is just as amazing on the inside as it looks on the outside. 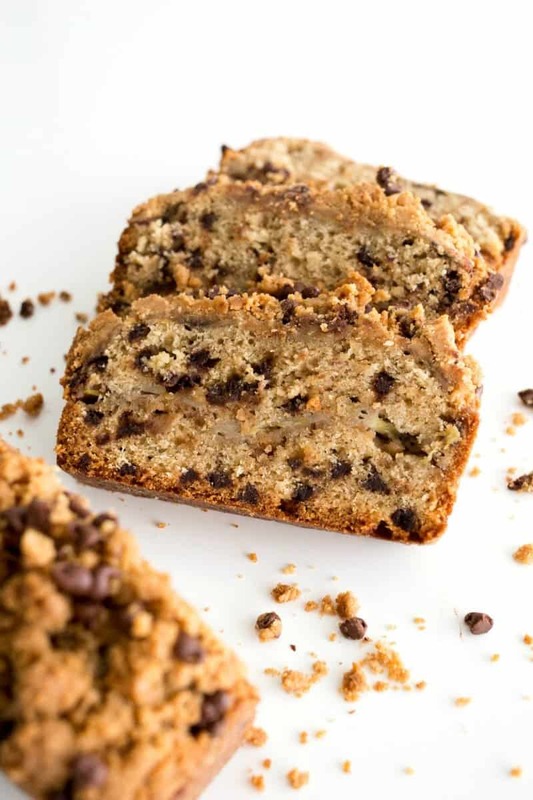 Moist banana bread with mini chocolate chips and pure peanut butter flavor all throughout. 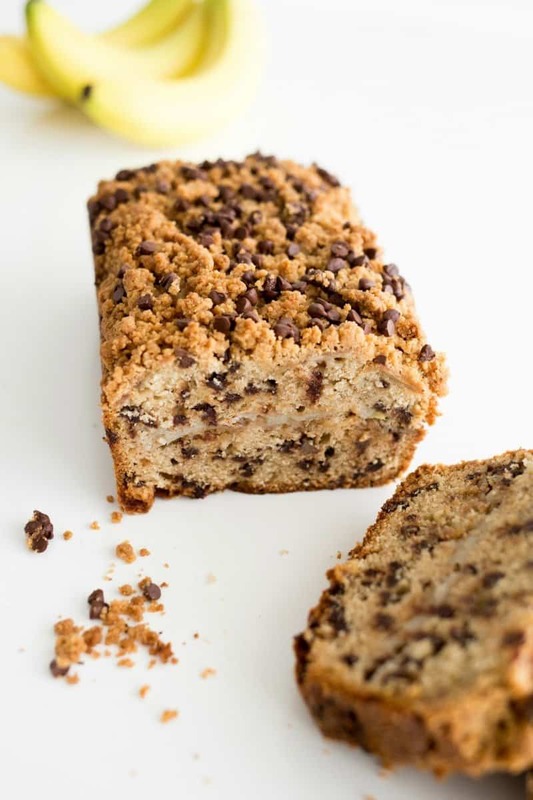 A layer of sliced bananas in the middle just for more banana yum and that crumbly sweet streusel on top. The most craveable banana bread I’ve baked to date. 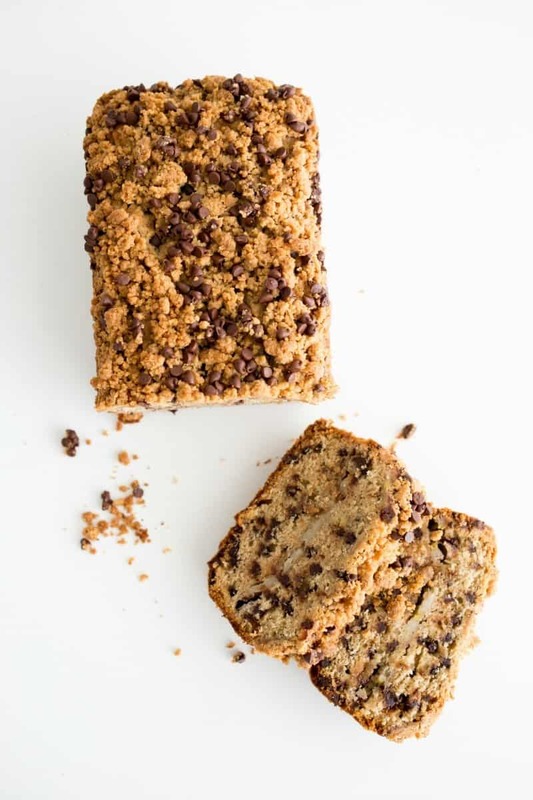 Do yourself and your loved ones a treat and bake this peanut butter chocolate chip banana bread. You’ll be soooo glad the recipe makes two loaves! It’s unbelievable. Preheat the oven to 350°F. Grease and lightly flour two 8-inch x 4-inch loaf pans; set aside. Make the streusel: in a small bowl, stir the peanut butter, brown sugar and flour together with a fork until crumbly; set aside. To make the bread batter: in the bowl of an electric stand mixer, cream the butter, peanut butter and sugar until light and fluffy. Add eggs, one at a time, beating well after each addition. Beat in vanilla. In a separate bowl, whisk together the flour, baking powder and baking soda. Add the flour mixture to the ingredients in the stand mixer and beat on low to medium speed until well combined. Fold in the mashed banana and then 1 cup mini chocolate chips. Scoop 1-1/2 cups of batter into each of the prepared loaf pans, spreading into an even layer. Sprinkle each layer with ⅓ cup streusel. Create an even layer of sliced bananas over the streusel layer in each pan. Scoop 1-1/2 cups batter over the banana layer of each pan, spreading even. Then sprinkle with ⅓ cup streusel evenly over each one, pressing lightly so the streusel sticks to the batter. 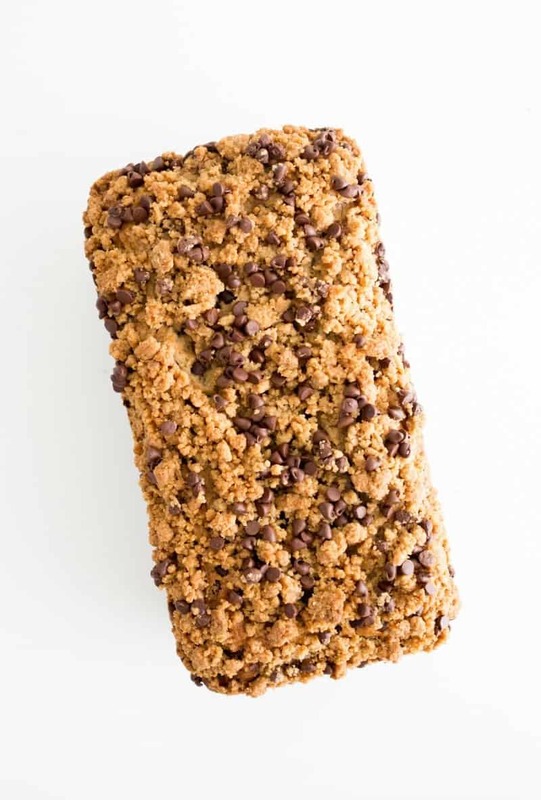 Sprinkle ¼ cup mini chocolate chips over the top of the streusel on each loaf. Bake for 60 minutes or until a toothpick inserted near the center comes out clean. Cool for 15 minutes in the loaf pans before removing to wire racks to cool completely. 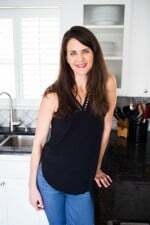 The recipe makes two 8x4-inch loaves. Eat one now, freeze one for later (just let cool completely and wrap tightly in plastic wrap before placing in a resealable freezer-safe bag) OR keep one to enjoy yourself and give the other to someone you love. 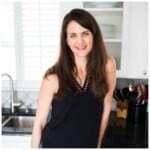 Can domata flour be used? And can the chips not be used. Oh lordy – I just took this out of the oven. The house smells fantastic, the chocolate is gooey and wonderful, and somehow it’s less sweet than I thought it’d be – which is a good thing! This is fantastic “straight up”, but tonight I’ll be putting ice cream on top of it. Just because. We LOVED this. I baked it with c4c gluten-free flour and had to cut the time down to 45-50 minutes. It was definitely done at 50 minutes–should have checked it even sooner. The only comment my husband made (while stuffing the third slice in his mouth–hah!) was that the sliced-banana layer almost made it seem like it wasn’t done in the middle. I might omit that next time for that reason. 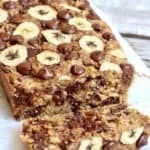 The peanut butter in this makes it amazing! Thanks! 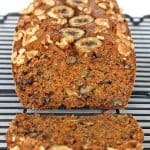 This is the best banana bread I have ever eaten. I have made this three times and everyone loves. I have even made it gluten free since my daughter has celiac and crohns. Thanks for the amazing recipe. I sliced the banana thinly and put it in like the recipe called for and Wow pure magic. Everyone loves this extra layer of bananas. I’ll be trying some of your other breads as well. Love the pictures of your beautiful family!! I don’t have enough bananas to do the middle layer. It will still turn out delicious, right??? Hi Rachael! No worries, it will still turn out great! 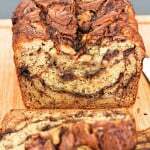 The middle layer just creates an extra swirl of banana flavor. Enjoy! Hi Laurel! 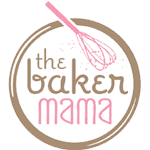 Yes, just divide the batter between two 9×5″ pans. They will still turn out great! You wouldn’t be able to fit all of the batter in one loaf pan though. It would overflow the pan when baking. Enjoy!